The Rockford IceHogs, AHL affiliate of the Chicago Blackhawks, have struggled on the defensive end to start the 2015-16 season. Coach Ted Dent must have pushed the right buttons at practice prior to this past week’s action. The Hogs were stingier and have won three straight games because of it. Rockford bested Centrals Division foes Iowa, Chicago and Milwaukee in Week 3 of the AHL schedule. The IceHogs are 4-3, good enough for fourth place in the eight-team division standings. It was a big week for Rockford. As well as getting back above .500, the IceHogs made a move that should provide the veteran leadership a young team will need this season. It was also a big week for rookie center Tanner Kero. On Monday, it was announced that Kero was selected as the CCM/AHL Player of the Week for his recent performance. The former Michigan Tech standout had three goals and an assist in Rockford’s three victories. That included a two-goal night against Iowa Wednesday in which he scored the game-winner. Kero has played in 13 AHL games since signing with the Blackhawks this past spring. He has 11 goals in those games, including six so far in 2015-16. That’s good for third place in the AHL right now. Kero’s eight points lead the IceHogs; two of his goals were game-winners. 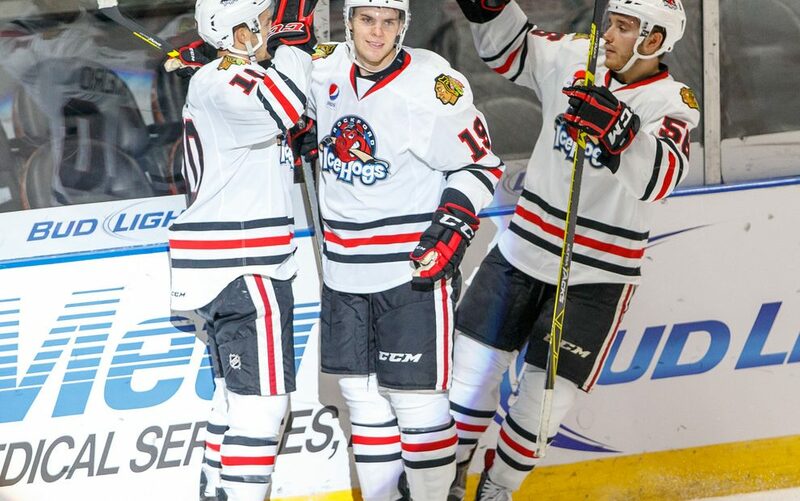 With Vince Hinostroza being reassigned to the IceHogs Tuesday morning, it would not surprise me in the least to see Kero get a brief call-up sometime soon. His play certainly has earned a closer look from the Hawks. The Hogs announced Thursday that they had signed forward Jake Dowell to a one-year AHL deal. 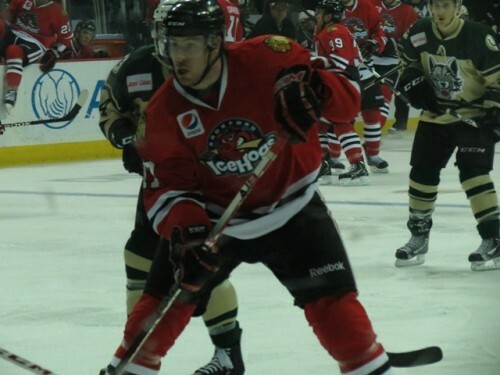 Dowell, who captained Rockford in the 2009-10 campaign. was on a PTO signed back in August. He provides Dent with a solid fourth-line center as well as experienced penalty killer. More importantly, Dowell is a respected locker room voice. Dowell and fellow AHL-signee Pierre-Cedric Labrie have been alternate captains in every game in which they have appeared since the team came back from its California trip to start the season. Defenseman Cameron Schilling was alternate captain with Brandon Mashinter (now the Hogs captain) in the first two games. Dent has been known to have different alternate captains for home and away contests in previous seasons. With two well-respected veteran skaters in the lineup, however, he may have decided upon a leadership group. It must be noted that Dent hasn’t formally made any announcement on this issue save for naming Mashinter captain two weeks ago. Rockford is tied for second in the Western Conference with 103 penalty minutes. As of Monday morning, the IceHogs 44 minor penalties equal Bridgeport and St. John’s to lead the AHL. Safe to say that Dent would like to see his team not skating a man down quite so much. The special teams are still near the basement of the league, though Rockford killed penalties at an 84 percent rate over the past three games. That included the IceHogs limiting the Chicago Wolves (who had the league’s third-best best PP unit going into the game) to one goal in nine tries Friday night at the BMO Harris Bank Center. The bad news is that Rockford has surrendered power play goals in six of its first seven games. On three occasions, they’ve given up two or more goals in this department. The IceHogs have allowed ten power play goals for the season, a figure that leads the league. The obvious message Dent needs to impart on his charges is to stay out of the damn box. Ryan Hartman, this means you. Hartman’s nine minors lead the AHL. This is definitely an area to keep an eye on as the season progresses. Rockford’s own power play has very nearly been impotent thus far. In 27 chances, the IceHogs have two goals. Each power play unit has one goal on the season. A one-for-ten effort this week actually raised Rockford’s overall percentage to a 7.4 success rate. As bad as this sounds, the IceHogs have actually had a lot of really strong shifts when up a man. It just hasn’t shown up on the scoreboard. Dent has stuck with his two units, which suggests that he believes that the scoring will come around. We’ll have to see if he mixes up his two squads this week. In addition to locking up Dowell for the season, Rockford called up forward Chris DeSousa Thursday. 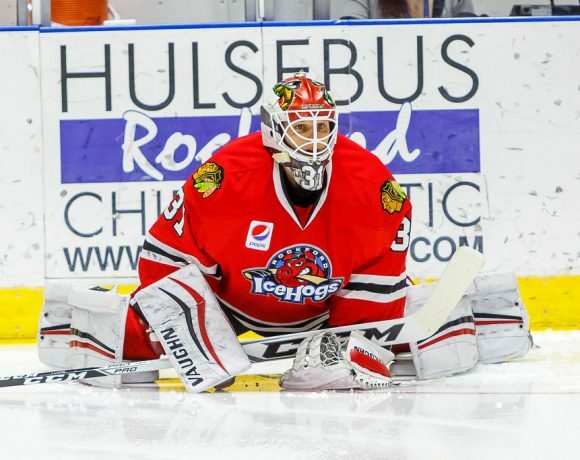 He made his IceHogs debut Saturday in Milwaukee. As mentioned above, Hinostroza was sent to Rockford Tuesday morning after four games in Chicago. Earlier last week, defenseman Dillon Fournier was sent to Indianapolis of the ECHL. Forward Dane Walters was assigned to the ECHL’s Toledo Walleye. It doesn’t seem to bode well for Fournier, who is in the second year of his entry contract, that he can’t break into the Rockford lineup. This despite the competition being thinned by organizational moves. Fournier was scoreless in two appearances against Texas before being sent down. Coming up from the Indy Fuel this week was defenseman Sam Jardine. Jardine unexpectedly left Ohio State before his senior season to sign an AHL deal with Rockford. He had an assist in two games with the Fuel. Jardine was a scratch in the Hogs three games this week. Although the IceHogs controlled most of the action, the outcome was not decided until the final minutes. Still, Rockford broke a three-game losing skid against the Wild. After a scoreless first period, the Hogs power play got a puck past Iowa net-minder Jeremy Smith. Brandon Mashinter’s second effort after he redirected a Ville Pokka blast nudged the biscuit across the goal line for a 1-0 Rockford advantage 2:04 into the second stanza. The Wild responded with a power play goal of their own three minutes later, but in the fifteenth minute, Tanner Kero took a pass from Jeremy Morin and fired a shot from just outside the left dot. The puck stealthily slid under the left pad of Smith and into the far side of the net. Rockford had several outstanding chances to extend its 2-1 lead in the third period but Smith kept his club within striking distance. In the fifteenth minute, Pokka failed to hold a puck in the offensive zone and Iowa caught up with it at the other end. After Michael Leighton stopped a pair of attempts, Maxime Fortunus knocked a bouncing puck past the Hogs goalie to tie the contest at two. Less than a minute later, Kero potted the game winner. The play developed after a Marko Dano dump-in took a funny bounce off the end boards. Smith was unable to collect the puck and Kero swooped in to deposit it into an empty net at the 15:09 mark. An apparent insurance goal was disallowed moments later. However, the IceHogs held on to pick up the win over their Central Division rival. Smith (third), Mashinter (second) and Kero (first) were the three stars on the night. Scratches-Sam Jardine, Kyle Cumiskey, Mike Liambas, Daniel Paille. Rockford nearly let this game slip away but still came away with two points in a crucial Illinois Lottery Cup (feel free to season the preceding four words with as much sarcasm as you can stand) matchup. Despite being out shot 36-19 in regulation and handing Chicago nine power play chances on the evening, the Hogs still were up 3-1 in the late stages of the game. Rockford took a two goal lead into the first intermission. Pierre-Cedric Labrie redirected an Erik Gustafsson slap shot 10:15 into the game. A minute later, Ville Pokka sent a shot that was partially stopped by Wolves goalie Jordan Binnington. As the puck lay dormant in the crease, Ryan Hartman managed to get his stick through a pile of Chicago players and knocked it across the goal line at the 11:17 mark. The Wolves halved the lead on a Danny Kristo unassisted goal in the second period, but Rockford restored the two-goal advantage with a nifty play 5:06 into the third. Jeremy Morin won a defensive draw and the puck was slid into the neutral zone by Kirill Gotovets. Brandon Mashinter collected on the left half boards and crossed the Chicago blue line with Mark McNeill skating up the middle of the ice. Mashinter’s pass found McNeill’s tape and the third-year forward express mailed it into the top right corner for a 3-1 Hogs lead. Chicago struck back with two goals in the latter part of the contest. Jeremy Welsh found the back of the net on the Wolves ninth power play at 13:59. 63 seconds later, Pat Cannone lifted a rebound past Michael Leighton to tie things up. The teams were a little tentative in Gus Macker Time, necessitating a shootout. Rockford trailed 1-0 after the first round, but Morin and Garret Ross beat Binnington to provide the final margin of victory. Leighton stopped 33 of 36 shots to nab third star honors. McNeill was second star, with the game’s first star going to Hartman. Scratches-Chris DeSousa, Kyle Cumiskey, Mike Liambas, Sam Jardine, Ryan Haggerty. 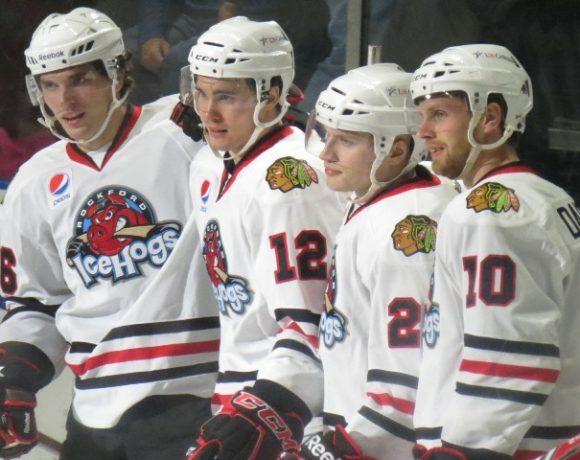 Marko Dano’s first goal of the season provided the winning margin as the IceHogs posted their third straight victory. The Admirals took a 1-0 lead when Stevie Moses, fresh from leading the KHL with 36 goals last year, flipped a backhander over the right pad of Michael Leighton five minutes into the game. I mention this because you might see Moses’s name in my Milwaukee recaps a lot; suffice to say this guy has some skills. Rockford drew even at the 6:42 mark of the second period following a neutral zone faceoff win by Mark McNeill. Brandon Mashinter was able to redirect a wrist shot from Kirill Gotovets past Ads goalie Juusi Saros. The IceHogs took the lead three minutes later on a delayed penalty. With six skaters on the ice, Jake Dowell’s shot rebounded out to Tanner Kero at the right post. Kero easily tapped it in on his backhand side at 9:40 of the second to put Rockford up 2-1. Midway through the final period, Milwaukee tied the game on a Max Reinhart power play goal. The IceHogs had a quck response to the goal, however. It started with a nice play in the defensive zone in the twelfth minute. Ryan Hartman forced a turnover from Milwaukee center Vladislav Kamanev, who had just taken possession of the puck in the slot. Hartman knocked the puck into neutral ice, with Dano catching up with it as it crossed the Admirals blue line. Saros was able to make a pad save as Dano bore down on him. Persistence paid off, though. Dano was able to collect the rebound and make a deposit in his twine account. At 11:40, the Hogs led 3-2. Hartman would account for the final Rockford tally, flipping a puck out of the defensive zone and into an empty Milwaukee net in the final minute. Dano was named the game’s first star. He and Hartman were both a plus-three on the evening with a goal and assist each. Scratches-Kyle Cumiskey, Mike Liambas, Jeremy Morin, Sam Jardine, Ryan Haggerty. Rockford will be seeing Central Division opposition exclusively for the next month. The Hogs host Charlotte Tuesday night and Iowa again on Friday before crossing the Mississippi and playing the Wild in DesMoines Sunday. Follow me @JonFromi on twitter for updates on the IceHogs throughout the week. If I manage to not leave my phone in my car (at my age I make no guarantees), I’ll send out updates from the BMO as Rockford tries to keep its current streak going.